Born in 1975 as the U.S. Bicentennial 10,000 Meter Run and renamed in 1976, the Birmingham Track Club’s Vulcan 10k is one of the area's oldest races. The 2015 race with be its 41st running. 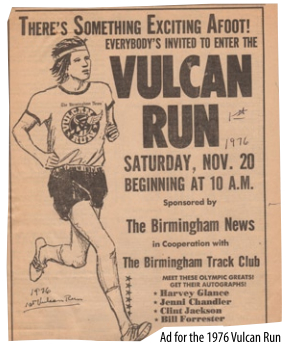 The fascinating history of the Vulcan Run has been documented in the Birmingham Track Club newsletter, The Vulcan Runner. Follow the links below to read the articles about the Vulcan Run from 1975-2012.